Looped-End Mop Heads Provide Surface Maintenance For Applications Including Residential, Commercial, Hospitality, And More. 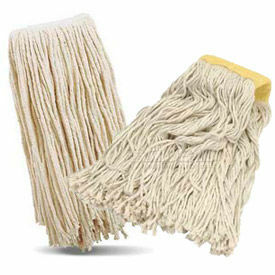 Looped-end mop heads are made of high quality materials for dependability. Heads allow convenient floor maintenance while reducing fraying, unraveling, and lint. Tailband prevents tangles and increases floor coverage for cleaning efficiency. May be laundered repeatedly for maximum usage. Sizes are Small, Medium, Large and X-Large. Package quantities are 1, 5, 6, and 12. Colors are Blue, Green, Red and White. Dimensions vary per model. 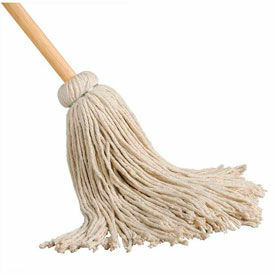 Cut-End Mop Heads Provide Surface Maintenance For Applications Including Residential, Commercial, Hospitality, And More. 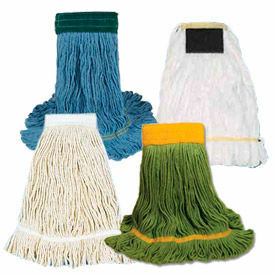 Cut-end mop heads are made of high quality materials for dependability. 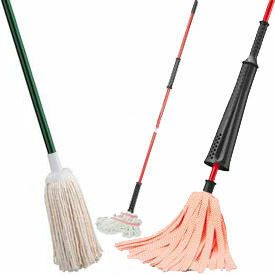 Mop heads allow ergonomic surface maintenance for tile, hardwood, laminate, and more. Optimal absorbency reduces required soaking time for cleaning efficiency. Fast release promotes drying efficiency and mildew resistance. Accommodates floor finishes and disinfectants. Available with or without tangle band. Available styles include Commercial Wet Mop, Edgeless Lint-Free Mop Head, Flo-Pac® Mop, Layflat® Wet Mop, MaxiCotton™ Screw-On Wet Mop, MaxiRayon™ Screw-On Wet Mop, Narrow Band Mop, Saddle Type Wet Mop, Valumax Wet Mop, Wet Mop and Wide Mesh Band Mop. Package quantities are 1 and 12. Colors are Blue, Natural, and White. Dimensions vary per model. Mop Handles Support Various Mop Frame Styles For Applications Including Residential, Commercial, Hospitality, And More. Mop handles are made of high quality materials for dependability. Mop handles are available in multiple styles for frame and application versatility. Steel grip style includes a stirrup feature allowing soiled mop replacement without required handling. Plastic jaw model firmly clamps mop head for unit stability. Available types are Clamp, Grip Style, Hollow, Jaws Mate, Quick Change, Screw Clamp, Screw-In, Side Gate, Snap N Go Handle and Threaded. 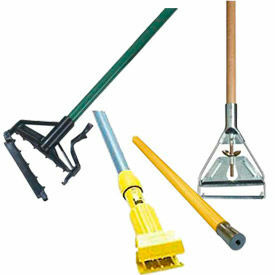 Mop & Handle Combos Are Used For Industrial, Nautical And Janitorial Cleaning Applications. Mop & Handle Combos are made from a variety of fiber materials for better absorbency with steel or wood handles for strength and long lasting durability. Includes mop and handle from a variety of brands and presented in many style and material selections. Reliable brands offer various types such as Cut-End, Looped End and Twist. Mop fibers and package quantities vary by model. 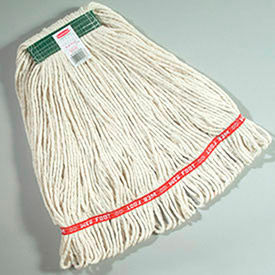 Mop head refills are also available and sold separately. 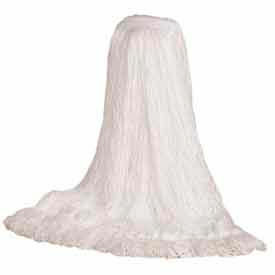 Finish Mop Heads Are Used For Various Cleaning Applications.. Finish Mop Heads are designed for spreading an oil- or water-based floor finish to protect the floor's surface. Finish mop heads also absorb moisture well and dries faster. Mop heads provide steady release with very low linting and reduce worker fatigue. Sizes, cleaning widths, and dimensions vary per model. Combo mops contain both mop handles and heads packaged together for ease of use. Available with rayon or yarn mop heads, with 60" steel or wood handles. 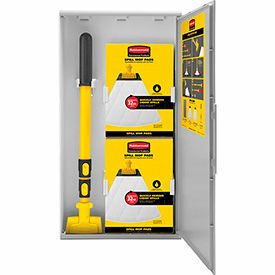 The new Rubbermaid Commercial Products’ Spill Mop cuts the overall time required to completely remove a spill in half versus a cotton string mop leaving a safer, drier floor. Types include Spill Mop Pads, Biohazard Spill Mop Pads and complete Spill Mop Kits and Biohazard Spill Mop Kits. Additional handles and Storage Cabinets also available.